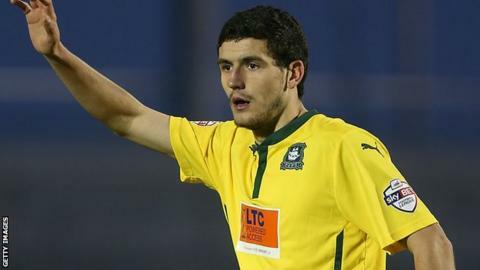 Anthony O'Connor has turned down the chance to sign for League Two side Plymouth Argyle on a permanent basis. The 22-year-old defender has spent the first half of this season on loan at Home Park from his parent club Blackburn Rovers, playing 29 times. Argyle were prepared to pay a fee for the Republic of Ireland U21 player. "We offered Anthony O'Connor a permanent deal and Anthony O'Connor doesn't want to sign a permanent deal at any club," said boss John Sheridan. O'Connor, who had previously stated that he would like to has returned to Blackburn after his loan ran out last week. "He wants to keep his options open," said Sheridan. "Respect to the chairman, he was willing to pay the bit of money that Blackburn wanted, but it's Anthony's decision." O'Connor's departure led to the Pilgrims as Sheridan is without injured centre-back Peter Hartley out for a month. "He's gone back to Blackburn and we're just trying to sort a deal out to get him back until the end of the season on loan," added Sheridan. "He's keeping his options open, he's playing well, and I'm hoping we've still got a chance of getting him. "But I'm not going to let it drag on. I'd like think if there was a chance it'd be done by next week."